Earlier the basic necessities were limited to food, clothes and Shelter. As we all know , that, everything changes with the time, so has had happened with the basic necessities of an individual. Basic necessities of an Individual has also changed over a period of time. Telecom is an add on to the basic necessities of an Individual. Unlike, the earlier basic necessities, telecom has so much to do with technology. Of those technologies, GIS is the one playing major role for telecom Industry. Lets see, how GIS for Telecom is useful, reasons to use GIS for telecom. 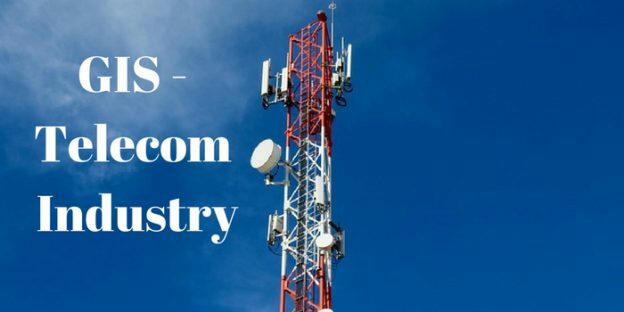 What is Telecom Industry ? Telecom Industry is one of the Vast and the Vital industry, serving its customers with varied number of players. Telecom Industry has enormous number of companies making it an Industry. It is a service providing industry, Consisting of telecom companies like IDEA, Airtel, Vodafone and many more are there. Telecom industry makes us communicate over networks. It helps us to connect with our friends, family, relatives. Now here the question popping in our mind is how do they provide these services in every corner of the country, what might be the problems faced by them , how do they solve these problems? Now, lets discuss what these problems stand for. Capacity Planning : Capacity planning is related to the planning of providing the network to the each and every area of the country. Capacity planning is required to know the areas or locations where we need to focus for providing the services. Personnel Management : The success of the company lies in its management. Management is responsible for managing the resources of the company. While, the management of personnel is a very crucial task. One needs to be very clear while allocating resources to the location according to the requirement. Market Segmentation: Market Segmentation is the need of every business. No business can succeed without proper market segmentation. Segmentation of the market refers to the division of customers or consumers in different groups. One needs to be very careful while segmenting the market. As segmentation is one of the vital and major attribute of the Business. Real-Time knowledge of network structure : Every Telecom company has to have the proper know how of network structure for any particular region at the given point or period of time . Demand Forecasting : Demand forecasting again depends on the various attributes one of them is market segmentation and the previous data also helps in forecasting the demand. These are all the problems faced by telecom industry, but the question is how do they deal with it. As it is not possible to evaluate everything regarding the area and the region on the basis of previous data or the printed maps. So now lets see what is the solution of these problems. The solution to all the above mentioned problems is GIS. How GIS is the solution ? GIS for Capacity management : As we know that capacity management is about the planning of providing the services to whom they have not reached yet. So GIS can help in locating the regions and areas on their Map, where they have not reached yet, or where they need to improve. GIS for Personnel Management : GIS is very useful for allocating resources according to the requirements. GIS helps telecom company in identifying the areas where there is the requirement of the personnel. It also helps in identifying the number of personnel required, for which post they are required. All these can be done on the Maps with the help of GIS. GIS for Market Segmentation : Market Segmentation can be done more efficiently on the maps with the help of GIS. One can easily divide the customers according to their groups, and then it becomes easy for them to allocate the towers for their network , where do they need to implant more towers, according to the complaints and grievances of the customer from different region. GIS for Real Time Knowledge of Network Structure : Telecom industries can easily access their network points and signals, where are the signals reachable and where not, whether the signal is weak or good. It helps them in analysing the network status and structure as well for a particular region at particular point of time. GIS for Demand Forecasting : Telecom Companies can use GIS for forecasting the demand of their products along with the help of the previous data and the market segmentation. With market segmentation company can know what is their target Market. It makes easy on the company’s perspective if they know well about their target Market. These are the problems faced by telecom industry, and the ways in which GIS helps in solving these problems. Do pen Down your experience with GIS in telecom, in the comment section provided below. I am a geomatician and I would like to develop the tools for a telecommunications company. do you have lessons on top to help me or old project?